Marina Cervera – Master in Landscape Architecture Barcelona – Universitat Politècnica de Catalunya – 35ª EDITION. Degree in Architecture from the ETSAB (UPC) in 2003. Graduated as Master in Landscape Architecture from the same university. He has received several scholarships, such as the Mies van der Rohe Foundation (2001), the Caja de Arquitectos Foundation (2002), the CRPP (Landscape Projects Research Center) and Lenôtre (Landscape Education: New opportunities for teaching and education and research in Europe). In 2014 he obtained his Master’s Degree in Urban Planning (UPC) and since then he has done his doctoral thesis. His professional practice has been developed through Ateliers Jean Nouvel (Paris), the Landscape Research and Projects Center (CRPP, UPC) and since 2003 through his own professional practice in Barcelona, which includes planning, landscape architecture and architecture. She combines her study work with her tasks as Executive Director of the Office of Landscape Architecture at the College of Architects of Catalonia (COAC) and as a Member of the Executive Committee of the International Landscape Biennial of Barcelona. She is an associate professor at the Universitat Politècnica de Catalunya. BarcelonaTech ETSAB, DUOT and teacher at MBLandArch. 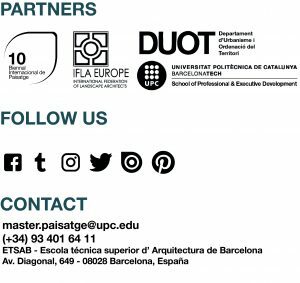 He also teaches urban design and landscape architecture in the public space workshop of the Master’s Program in Landscape Architecture (Fundació Politècnica de Catalunya) and gives conferences, seminars and international workshops throughout the world. In the field of professional activism, she is President of Professional Practices and Policies of the International Federation of Landscape Architects (IFLA), has contributed locally to European institutions and local institutions and is a member of several editorial boards of publications related to landscape architecture, projects and professional practice strategy.